The town of Gothenburg is located on Sweden’s west coast, or the ‘best coast’ as the locals competitively call it in an attempted poke at Stockholm which is on the east coast. Spending a day here, it’s easy to feel the constant presence of the sea. Many of the streets have sea-related or harbour-related names and on the menus around town are a plethora of fish and seafood specialities: hand-peeled shrimp, freshly caught cod and classic fish gratin amongst them. At the top of the main restaurant stretch, known as Avenyn, is a statue. 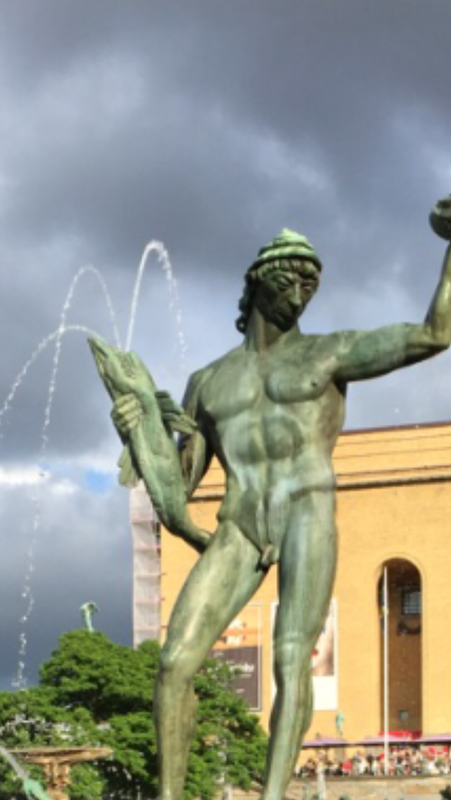 This statue is the grand figure of Poseidon, created by Swedish sculpter Carl Milles. There Poseidon stands in all his naked glory, willy dangling, fish in one hand, guarding the city of the sea. The city is currently packed with thousands of tourists, mostly in football gear. This week sees the annual event of the Gothia cup, a football competition for youths that attracts teams from all over the world. Gothenburg strikes me as a proud place. Proud of its unique position, proud of its role as Sweden’s second city and, not least, proud of its strong nautical heritage.